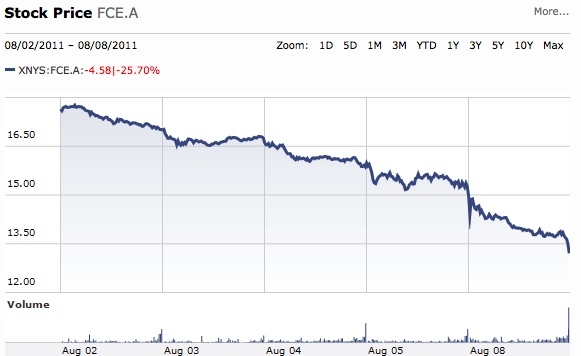 Forest City Enterprises shares went from $17.63 at the opening, Tuesday, August 2, and closed yesterday at $13.24. down 13.46% for the day. By contrast, the Dow Jones Industrial Average was down 5.55% and the iShares Dow Jones U.S. Real Estate Fund was down 8.51%. 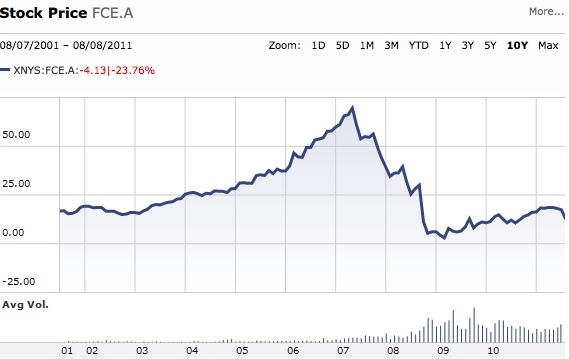 Forest City's stock is down 24.9% over five days, as shown in the first chart, via Morningstar. As the second chart shows, FCE.A has had quite a roll up and down over the past decade; anyone who bought at the peak in 2007 lost big, but anyone who bought at the lowest point, in early 2009, is still doing well. It's probably too soon, given the national volatility, to make any predictions, but presumably Forest City is now under more pressure to deliver value to shareholders, and to cut costs and/or raise capital. Its Forest City Ratner subsidiary earlier this year sold a 49% stake in 15 New York-area retail and entertainment properties to a firm that specializes in joint ventures with "fatigued" underlying investors. Does this mean they're now more likely to sell a stake in Atlantic Yards to non-fatigued Russian billionaire Mikhail Prokhorov, who already bought 80% of the New Jersey Nets and 45% of the arena holding company?